This piece of faded, folded paper is 8 3/8" x 10 7/8" (the standard 8 1/2" x 11", shaved 1/8" on each dimension). It looks and feels like a nice 20# bond; it has no watermark. It has several folds in it going in both directions. It has a few small tears at the ends of some of the creases. The set of folds I think of as primary allowed it to be a trifold document. Everything is handwritten in pencil; that on the "cover" panel is in blue pencil. The writing looks like that of Jean La Forêt on the many documents I have posted previously. 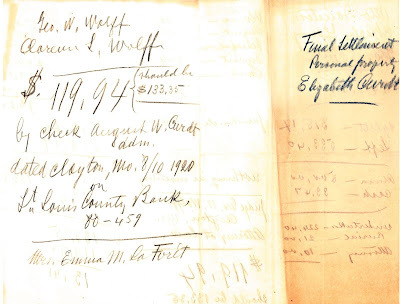 This then has to do with the final estate of Emma's mother, Elizabeth (Walz) Curdt, who died in 1919 in suspicious circumstances. So this gets us into some details of Elizabeth's estate. Most of it appears to be breakdowns of amounts owed, while some items seem to be Jean's notes. Who were Otto Dauster, Charles Young, and Geo[rge?] Appel? Did they conduct the inventory on Elizabeth Curdt's estate? The number 848.64, under the three names at the top of the left panel, shows up at the top of the middle panel and in computations on the right panel. The occurrence on the left panel isn't connected to anything else. Below the figure, however, are a "split" of 315.17 and "left" of 533.40. These figures are similar to those in the second section of the right panel but don't quite add up to 848.64. But what is the split? The next section on the left panel shows an amount of 500.00 for Alvina and cash of 33.47. The total of these two 533.47, matches that in the third column, but what is the cash? The cash listed in the middle panel is 10.14. There were two cash accounts? The bottom section on the left panel has more costs: 224.40 for the undertaker and 21.00 for burial found plausible. But only 10.00 for an attorney? What did an attorney do for only 10.00? Say, "Good morning"? The top of the middle panel has a column of figures. Alvina and August were two of Elizabeth's children with Louis Curdt; Schaefer was the husband of Louisa, the other daughter. So the first three figures are Elizabeth's children. The figure for Alvina is the same as that listed in the first column. Did she receive a larger amount than her siblings because Elizabeth had been living with her? And why are a deposit and cash in the same column? The total written for the column is the same number as the first one on the left panel, but the numbers don't add up right. When I add 500.00 + 25.00 + 25.00 + 204.50 + 10.14, I get 764.64. If I add the 34.00 listed below for "furniture etc", the total is 798.64. I'm not seeing the 848.64. We're missing 50.00 somewhere. 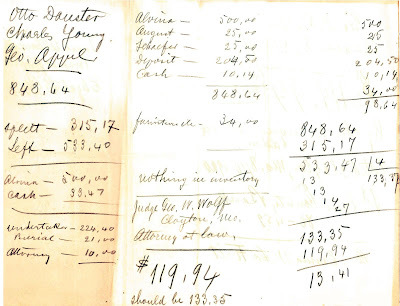 If there really was "nothing in inventory", as the next item says, are all of these figures on Jean's scribble sheet from cash? Doesn't the furniture count as inventory? It's listed with a value. Next we see the name of Judge Geo[rge?] W. Wolff, an attorney in Clayton. We've seen his name before: He was the president of the St. Louis County Land Title Company. Did Jean hire him? 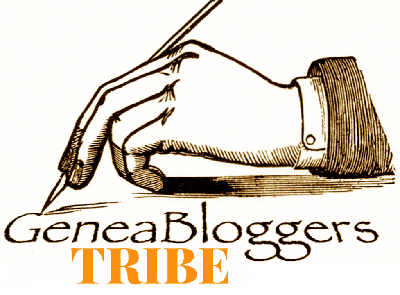 Was he a probate attorney handling Elizabeth Curdt's estate? Is his name on this sheet because he was president of the title company? The last section in the middle panel has $119.94 (the only figure on this side of the page to have a dollar sign) written larger and darker than other numbers. Below it is "should be 133.35." So Jean had a disagreement with one of the figures. The top of the right panel repeats the figures from the top of the middle panel, including the furniture, and this time mostly gets the total I did. It shows 98.64, whereas the total is 798.64. Jean lost his hundreds column somewhere; I guess he just forgot to write down the 7? In the middle of the right panel, however, 315.17 has been subtracted from Jean's middle-column total of 848.64, giving a result of 533.47, which is accurate for those two figures. Then come four rows of numbers in a configuration with which I am not familiar. I don't know if those numbers were subtracted to come up with the result of 133.35, or if the line under the 27 totally separates that set of numbers from the 133.35. And there's a 133.37 by the odd configuration; I have no idea what that means, but I find it interesting that it's only 2¢ different. This whole section has me bewildered. Maybe it's the "old French math" method. The last section of the right panel appears to refer back to the numbers from the bottom of the middle panel. The 119.94 has been subtracted from the 133.35 which "should be" the right amount, leaving 13.41. At least this math is correct also. 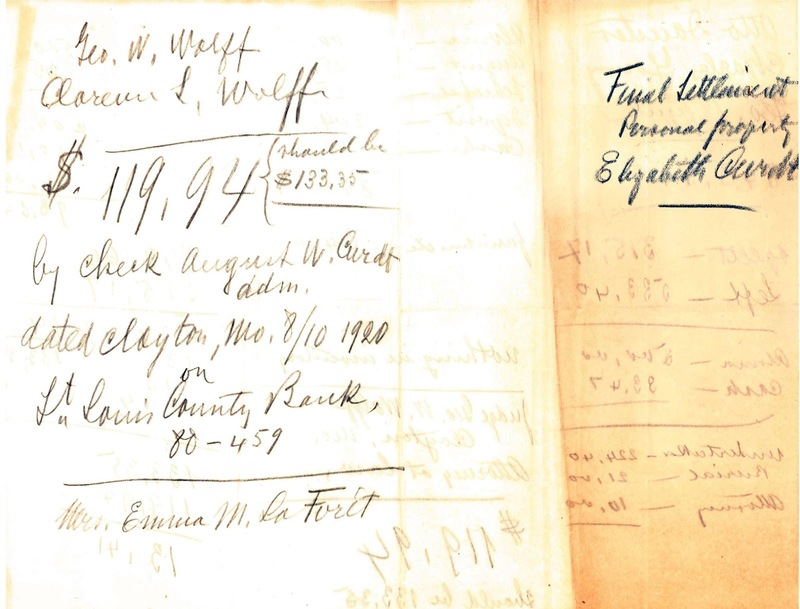 Returning to the other side of the sheet, at the top Judge Wolff's name shows up again, this time with Clarence Wolff. The latter is possibly (probably?) related to the judge, but we don't know. His name is not on the title company business card. The next section explains the $119.94 figure (but not its origin). It appears that's how much money Emma received out of her mother's estate. 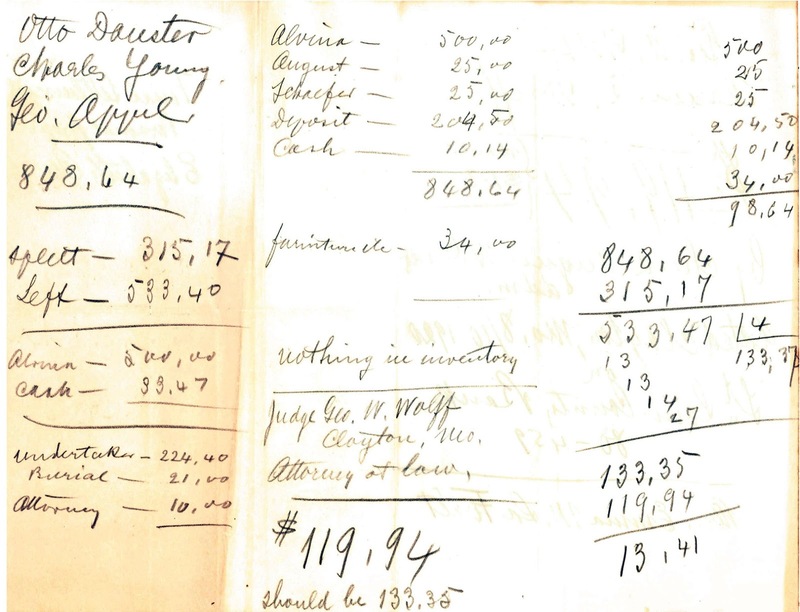 August Curdt, the administrator for the estate, wrote the check, dated August 10, 1920. But Jean repeated his note that she should have received $133.35. After looking through all the figures on this piece of paper, though, I can't figure out where the $133.35 or $119.94 figure came from. Maybe they'll show up on another page somewhere. Overall this page provides some information but raises more questions than it answers. I hope other documents in this pile clarify things later. Alvin received $500.00 in 1920. I did a calculation from the conversion chart of how much $500 would be worth today, 2017, and it came to: $6,387.09; that's a lot of money back then! Especially in comparison to the $25 that Alvina's sibings each received!